A Chimpy is an external rechargeable battery including a charging cable by the company Chimpy. In this sense, it is a power bank or portable power supply which you are not able to buy, but to rent. 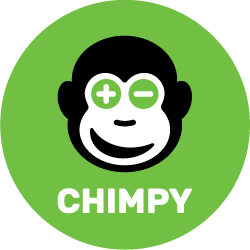 Chimpies are green, they have a monkey logo on it and they always come with the required cable. Furthermore, Chimpies are exclusively charged with solar electricity. Thus, a Chimpy always comes from Chimpy, makes sense, right?